Like the episodes of violence themselves—three of the nation’s five worst shootings in modern history have taken place over the last 24 months—responses to mass shooting events from politicians and activists seem to have adopted a routine. Those with an absolutist interpretation of the Second Amendment offer thoughts and prayers but insist that the immediate aftermath of a shooting is not the right time to discuss gun control. Those who wish to end easy access to high-capacity, military-style weapons say thoughts and prayers are insufficient without action and demand legislators stand up to the national gun lobby, now prompting a backlash by some conservatives who say the supporters of gun regulation mock religion. The shooting in Sutherland Springs, Texas, is only one of several deadly attacks at churches in recent years. Just days after the nation’s deadliest church shooting, where 26 people ranging from 17 months to 72 years old were killed by a lone gunman with an AR-15 semi-automatic rifle, a civilian model of the military’s M-16, the response followed the same well-worn path. There are signs that at least among some U.S. Catholic bishops, statements of grief and sorrow are being backed up with pledges to push for legislative action on guns. The statement also noted that the bishops continue to support universal background checks, restrictions on the possession of high-capacity weapons and increased access to mental health care. Chicago Cardinal Blase Cupich, interviewed at the University of Chicago by Washington Post writer and Commonweal magazine contributor E.J. Dionne on Nov. 6, renewed his call for a ban of high-power weapons, employing a grisly image about hunting to make his point. He also echoed Pope Francis, who has been fiercely critical of the weapons industry during his pontificate, asking the U.S. Congress in 2015: “Why are deadly weapons being sold to those who plan to inflict untold suffering on individuals and society? “Sadly, the answer, as we all know, is simply for money: money that is drenched in blood, often innocent blood,” the pope said. Speaking to reporters after the event, the cardinal was blunt in his call for legislators to take action. “Let’s start with these high-powered weapons. Both state and federal law need to change to make these guns not available. We don’t need military weapons in our society. We’re not supposed to be at war with one another,” he said. Other bishops also appear to be fed up with the lack of progress of gun control. In rural Vermont, where hunting is a common way of life, Bishop Christopher Coyne released a statement that seemed to suggest prayer should stir believers to take action on guns. “I find my horror at these murders to be mixed with frustration and guilt—frustration that we as a country cannot seem to come together to do anything about this evil plague and guilt that I bear for being part of a culture that fosters such violence,” wrote the bishop, who heads the communications committee of the U.S. Conference of Catholic Bishops. He called for prayers for the victims of Sunday’s violence but also for penance for a collective guilt that allows such carnage to continue. Catholic bishops in the United States have long supported restrictions on gun ownership, especially high-powered and semi-automatic weapons like those used in the Texas church shooting. Speaking to America, Archbishop García-Siller said he is “hopeful” that a debate about gun regulations could begin following the shooting. 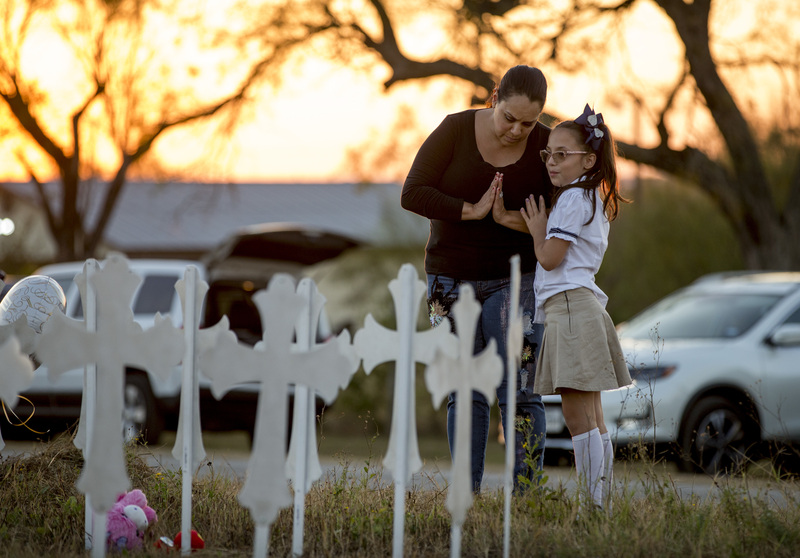 Catholic bishops in the United States have long supported restrictions on gun ownership, especially high-powered and semi-automatic weapons like those used in the Texas church shooting. Gun-rights advocates have noted that existing laws should have prevented the shooter from obtaining his weapon, but authorities were not notified about his domestic violence criminal background. Similar weapons were used in the shooting in Las Vegas on Oct. 1 that left 58 dead and hundreds injured; the 2015 office shooting in San Bernardino where 14 died; and the 2012 shooting in Newtown, Conn., where 20 children and six adults were murdered just days before Christmas. In 2015, the bishops pledged to continue advocating for a litany of gun control measures, including universal background checks, limits to civilian ownership of high-capacity weapons and ammunition and increased access to mental health services. It is unclear what effect a push for gun control by bishops could have. Father Kammer said bishops should consider partnering with “with other faith communities across the board.” He said the “corrupting power of money in our politics,” especially “the corrupting power of the National Rifle Association and its influence on Congress,” should be of particular concern. “If they do it, the bishops really need to commit serious resources to do it,” he said. Play here free online duck life and enjoy lots of fun click here and achieve the aim really fantastic place of fun duck life 4 free this one is sport game that makes the training montage actual game.Thanks for this one. Editors: Who do you think wants to join a serious and polite discussion when it puts one in the company of irrelevant remarks? I promise to try to keep my remarks relevant if the editors promise to exercise some judgement as well. First they came for the guns, so what would be next? How about trucks, cars, knives, machetes, pressure cookers and even household items(bombs) of daily use that have been used as weapons in mass murders recently? Inanimate objects kill no one, individuals kill and Chicago and other major cities with the strictist gun control laws show the folly of stricter laws. Why doesn't Cardinal Cupich and his Bishops, Monsignors and priests walk the mean streets of Chicago every night preaching the Commandment "Thou shalt not kill" to the potential shooters rather then sitting in their homes and offices and blame guns? Sure, all those tens of thousands killed by pressure cooker bombs every year should be addressed. But you do have a point about cars. An artificial necessity that should be reduced. At least in the next few years, AI piloted cars will hopefully take the testosterone, arrogance and natural stupidity (NS vs. AI) out of the loop. "AI piloted cars" could be programed by ISIS and other terrorist organizations or even remotely controlled to be weapons of mass killings. You fail to remember the Boston bombers and the NYC's Chelsea/ NJ bomber whofailed to kill anyonebut injured many and you might call up a CNN website which details the world-wide terrorist attacks using trucks and cars. “Why are deadly weapons being sold to those who plan to inflict untold suffering on individuals and society? then our Bishop’s Conference will have to turn its attention to using its well-known powers of evangelization to persuade fellow Catholics who are NRA members, as well as fellow Catholics who are in the leadership in both the House and Senate, to withhold NRA dues until the NRA leadership stops intimidating our elected representatives over votes of conscience. And they might, during their schmoozing sessions with Trump and Pence, turn those evangelization powers loose on them as well. Never mind the endangerment to deals that might have been agreed to regarding the provision of government contracts to Catholic Charities and Catholic Relief Services. Those truly worthy organizations will survive. If God the Holy Spirit is on any side, my guess is that God is on their side. “…Your will be done on earth as it is in heaven…” That phrase from the prayer that Christ Himself taught us provides me with the right attitude after major tragic events. God is less concerned with our “thoughts and prayers” than with our making His will be done here on earth. And, no matter how I slice the issue in my mind, I don’t believe that God's will includes an advocacy for the second amendment of the USA Constitution as it is currently interpreted by gun-toting ministers and many USA citizens. USA Bishops, charged with responsibility to provide moral guidance to their Catholics, apparently haven't figured out how to go about doing it. Their NCCB letters serve a political purpose to demonstrate their alleged concern with current issues. I don't see or hear guidance about the issues from my parish pulpit. Which ultimately makes one wonder about the quality of moral guidance that we are getting. Their reluctance to make a moral pronouncement on issues such as the availability of military weaponry, and impose it on Catholics, is profoundly disappointing. If it's God's will to be done on earth, it seems to me that AK-47's in the hands of ordinary citizenry at the least is not part of God's will, at worst is serious sin, and should be plainly stated and imposed on Catholics. This article also appeared in print, under the headline "After Carnage in Texas, U.S. Bishops Renew Call for for Gun Control," in the November 27, 2017 issue.